@AllenPrep @brettrichey @kevinphwap gotta write the story based on actual evidence, not hearsay. Scandal is presented fairly. So who was responsible for the insider cheating at Absolute Poker, in which millions of dollars were taken from players? Ben Mezrich’s new and gigantic literary fraud, Straight Flush, provides no answers, except to claim that it wasn’t Scott Tom, AP’s co-founder, who was inextricably linked to the cheating years ago. Since the book is a retelling of the story based on the recollections of Tom and his SAE fratboy partners-in-crime, that’s hardly surprising. Of course, the little bit of evidence that Mezrich supplies, he gets wrong, if not outright falsifies. The rest he ignores, and the end result is that Scott Tom is free to return to the original lie as told in an early AP press release way back in 2007: it was all the work of an unnamed, low-level employee, who was out to frame Scott Tom. If there was a selected fall guy for the AP cheating, it was probably Grimard, not Brent Beckley, who Mezrich has recently assigned to that role. Why Grimard? Because he was the management person who could shoulder the blame, if need be, without endangering the ownership/management positions of the Tom/Tatum group at the core of AP. Since the company was very much in the midst of a battle with UltimateBet, where a similar cheating scandal was also unfolding, it was vital that the AP owners not be officially blamed. Therefore, Grimard was the designated fall guy, even though his name was not allowed to be inserted into any official reports or findings. Nor did Grimard ever leave the AP family; he was simply shunted over to a connected entity of Hilt Tatum’s, given a nice bonus, and he remained associated with Absolute all the way until the forced post-Black Friday dissolution in 2011. 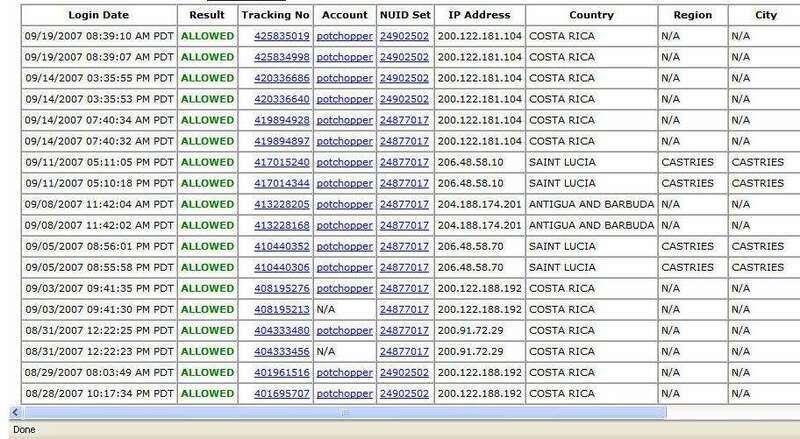 Because upon analyzing the IP addresses and user details that had been provided by the anonymous Absolute Poker employee along with the hand history, it appeared that there was an observer account — number 363, to be exact — associated with Potripper’s winning play — and that both 363 and Potripper’s IPs could be traced back to Costa Rica. Once the blogger sleuths got hold of that information, it was just a few more steps, a little more research — and they’d uncovered the e-mail associated with account 363. That e-mail was [email protected] And according to the bloggers, that e-mail linked directly to the founder of Absolute Poker. Pete [Barovich] felt like he was in the presence of a volcano that was seconds from erupting. A moment of tense silence swept through the room as everyone at the dining table watched Scott struggling to regain control of his features. Pete had seen Scott mad before — even in college the guy could be volatile — but this was different. This was terrifying…. And on from there, cut from whole cloth and marinated in slime. Except it wasn’t quite like that. Yes, both the the “363” and the “[email protected]” factums were key elements of discovering Scott Tom’s involvement, with this “blogger” among the many people involved in their discovery. Back in April of 2010, I published additional information regarding the involvement of Scott Tom, including evidence showing it could not be a low-level employee, as was claimed back then and as Mezrich reasserts now. This is a link to the first post in a series of several AP-related posts that explores some of the proof regarding the involvement of Scott Tom and friends. In that first post, I also shared the general story of the AP cheating as it was understood back then, though I learned much more in the months and years that followed. The account Scott Tom used for the cheating, as “POTRIPPER”, was account #2234890, one of several that Scott and his father, Phil Tom, controlled. The observer account, #363? No one outside AP knew who that was, until an investor told me — and the man himself behind it was forced to confirm the connection when faced with the evidence I possessed. “[email protected]” was Brian Coffey, a close friend and one-time roommate of Phil Tom’s, Scott’s father and AP’s longtime chairman of the board. Coffey, a home contractor, performed extensive home remodelings on both Phil Tom’s expensive off-Strip home in Las Vegas and on Scott Tom’s huge home in Costa Rica. He even lived with Phil at that Las Vegas home for a while. Coffey was also paid through the Absolute Poker site for his work (to launder the money a bit), owned 30,000 shares of AP stock, and bragged to other investors that he was allowed to use the cheating tool at the poker tables as well. Coffey acknowledged owning the account — though he denied using it for cheating — in an e-mail I published in this post. If this alone doesn’t tell you that the story Mezrich spews is unadulterated horse manure, ask yourself this: How would any so-called “low-level employee” know the connection between the “363 / [email protected]” and “2234890 / Scott Tom” accounts, and thus be able to employ them together in a cheating scheme? Pete Barovich, in Straight Flush, acknowledges initially helping to cover up the cheating, though Mezrich doesn’t ask exactly what he did. The rivieraltd.com domain, contrary to Mezrich’s claims, was a private e-mail server for AP execs that was very active at the time the cheating was discovered; the domain wasn’t even registered until February of 2007, just months before the cheating was discovered. This marks yet another Mezrich lie. Barovich himself is likely the person who made dozens and dozens of frantic changes in the hours and days following the discovery of that domain. There were over 80 separate changes made to the domain information on and after October 16, 2007, when the cheating links involving Scott Tom were first discovered. And now, on to the really good stuff. Mezrich barely mentions that several accounts were involved in the cheating, but names only POTRIPPER. Among the others were POTCHOPPER, GRAYCAT, STEAMROLLER, PAYUP, DOUBLEDRAG and ROMNALDO — more than the three mentioned by Mezrich, but facts aren’t his strong suit. The imaginary low-level employee Scott Tom blames would have to have preexisting knowledge that all of these accounts were controlled by Scott Tom, even though some of these accounts had others’ names attached, such as “Jaeson,” who appears to have been a bartender at that infamous Seattle dive where the boys played poker while developing the startup from Phil Tom’s basement. But it’s how the cheating was done — or rather, the covering up of it — that’s the largest Scott Tom / AP / Ben Mezrich lie of all. As part of my research, I was able to obtain the “ieSnare” security screen grabs for many of the accounts, which showed account ownership info, logon dates, transfers and associations between other accounts, and much more. I’ve published a lot of that already, but not all. How Scott Tom did the cheating was to set up a dual-partition arrangement on his personal laptop, with the AP security software not robust enough to detect that the second client, on the alternate hard-drive partition, was the secret “observer”. The reason the entries show up in pairs is because the ieSnare data noted the logons from each of the two clients on Scott Tom’s laptop, which were on separate partitions and had to be logged into AP separately. One day after the accident, Scott Tom and Hilt Tatum IV and their significant others went ahead and resumed their Caribbean island-hopping vacation. All those logons from Saint Lucia and Antigua & Barbuda, sandwiched by Costa Rica entries? That’s Scott Tom himself, on his resumed Caribbean trip. Think about what that means: Unless that “low-level employee” was hitching a ride in Scott Tom’s jeans pocket, the tale Mezrich spews is quite literally a physical impossibility. A little less than two weeks after the jet crash, the ridiculous POTRIPPER tournament cheating ensued, a desperate and blatant grab for money to replace some of what was lost in the plane accident. The money’s needed purpose, no one on the outside may ever truly know. I published this information three years ago because of its vital importance. It’s been publicly available all along, and Ben Mezrich knows this. Here’s a final clincher: the ieSnare images I have came from the UltimateBet side of the Cereus Network hookup, and the data could not have been changed there after it was initially created, especially by anyone from the AP side. My documentation could not have been been forged, and the POTRIPPER details in particular match exactly to what was sent out to CrazyMarco from the AP side. Dear Mr. Mezrich: You are a slimy liar and a literary disgrace. 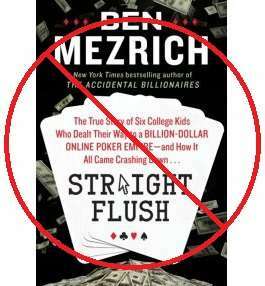 I’d hoped for better, but Straight Flush may well be the most shameful “narrative non-fiction” book of this era. That’s quite an accomplishment. I just tonight finished STRAIGHT FLUSH, and am now reading your extensive sequential posts criticizing the book. Fascinating, impressive stuff. Especially the detective work above. You are spot on about Ben, and most of the claims. A fee things to clear up as I am reading your 10 part series. Paula Hunt. No. Diana Hunt. Never a girlfriend of Tom Wenz. Just friends since high school, Sentinel High in Missoula. She also graduated Montana State. Not U of M.
Wenz? He had a hand in a lot of the cookie jar that he elaborately weaved himself in on the good and out when the bad started. The plane wreck. Substantiad. The money? Where does it makes sense it was going? To line the pockets of the few that knew the hammer was coming down. The fratboys you rip apart in this did have some innocence. Some did not. FYI…they mostly hated this edited and final version as well. They wanted most of the story out there. They didn’t want to rehab their past or future. That was written whether they liked it or not. But Ben? Yeah. He was a lazy, coked up has been that wanted another movie rights deal. Sadly for him the public found no interest in this Entourage wannabe tale. Too bad he didn’t stick more to the truth and relay some of the true stories they told him. They were the stories you can’t make up. Thanks for pointing out the typo — of course it was Diana Hunt, not Paula. I had the domain records all along but just mistyped that in the original.